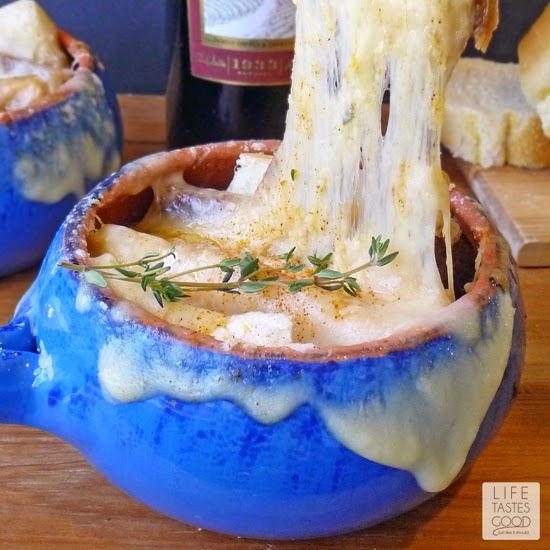 Cheesy French Onion Soup is a delicious blend of caramelized onions, herbs, toasted garlic bread, and lots of melty cheese. 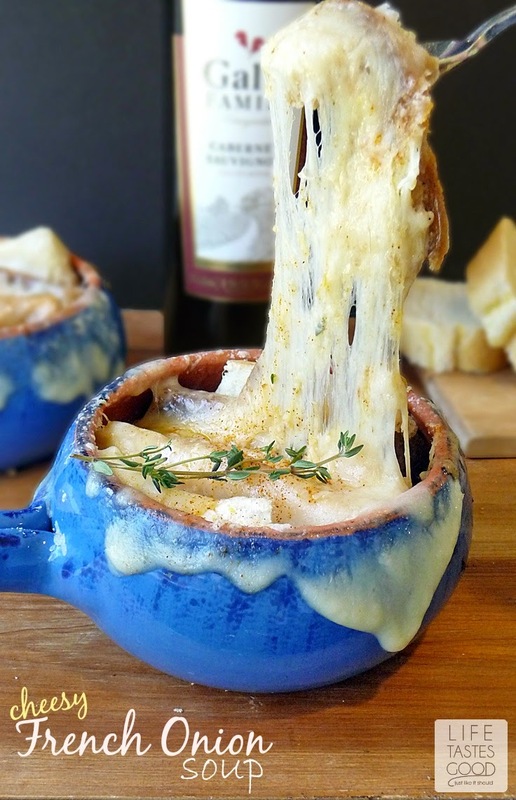 A pot of French Onion Soup simmering on the stove fills your home with its rich aroma. It is so enticing you'll find it hard to resist sneaking little sips here and there. This is comfort food for sure that hits the spot and warms the soul! There is just something so comforting about a hot and delicious bowl of soup. It warms you through and through from the first sip, and has a way of making you feel content. Soup is too good not to share, so whenever I make a big pot I always package some up to take to family or friends. Especially if someone is feeling down or going through a challenging time, sharing some soup is a great way to show how much you care. It is an easy and satisfying meal to just reheat and eat, and it gives you that comforted feeling of warmth and contentment. 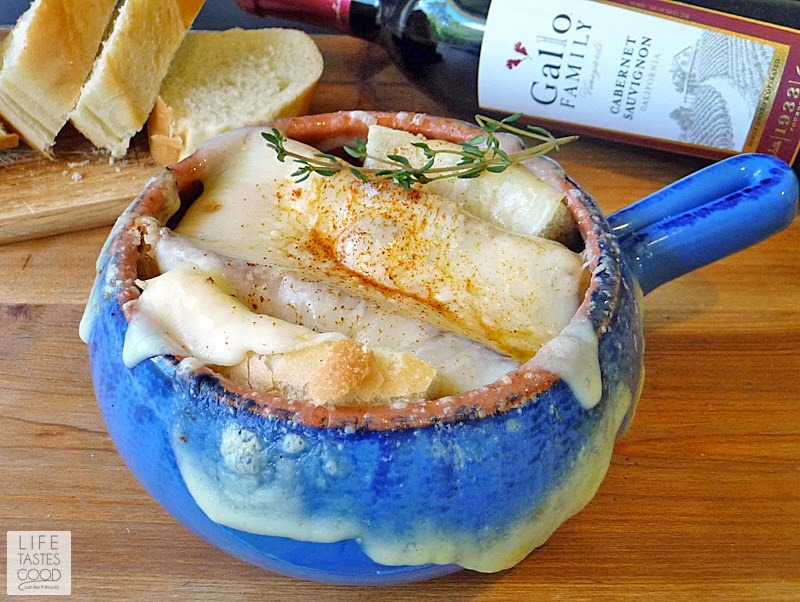 To enhance the flavor of this soup I added a deliciously bold, full-bodied wine by Gallo Family Vineyards. 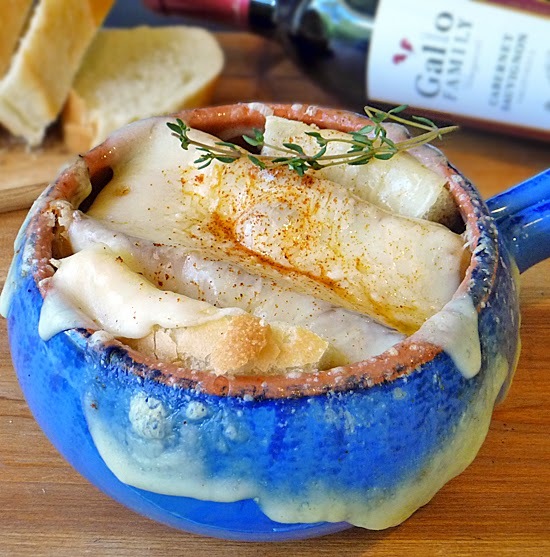 Gallo's Cabernet Sauvignon not only elevates the flavor in the soup, but is a great pairing with the soup and compliments the cheese nicely. Have you heard of Gallo's campaign to help stop hunger? 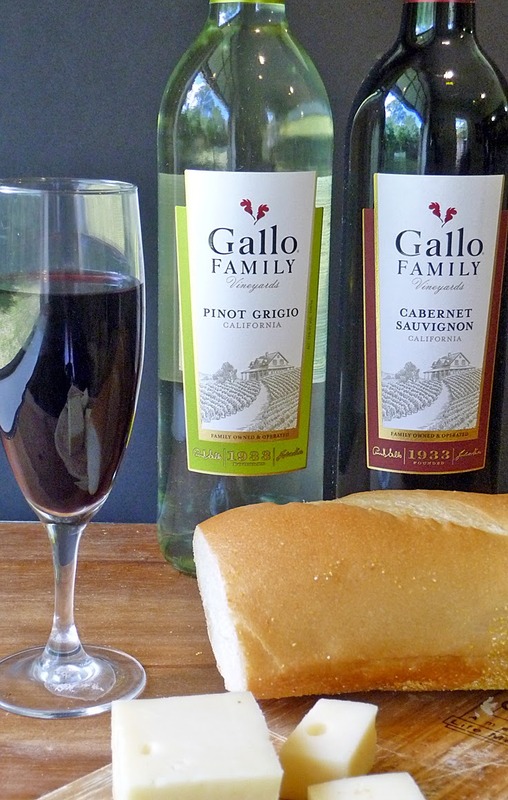 Every Cork Counts is a partnership between Gallo Family Vineyards and Meals On Wheels to fight hunger in America. From now until December 31st, Gallo Family Vineyards is helping feed families by donating $1 to the Meals On Wheels Association of America for every Gallo wine cork they receive back, up to $50,000!! How great is that? It's easy to participate in this wonderful campaign by saving your Gallo wine corks and mailing them back to Gallo or you can even just submit a picture of your corks. For detailed information on how to participate, please visit Every Cork Counts. Use this convenient store locator to find Gallo wine near you, and save $1 off your next bottle with this coupon! In a large stock pot over mid-high heat, melt 4 tablespoons butter. Stir in 1/2 teaspoon kosher salt, and all the thinly sliced onions. I used my food processor to slice my onions. It is very quick and easy. A Mandolin would work well too or you can slice them by hand with a sharp knife. Reduce the heat to medium and cook the onions for about 30-40 minutes until nicely caramelized. Be sure to stir them often and reduce the heat further if needed to avoid scorching. When the onions are nicely caramelized, add 6 cups water and 2 tablespoons beef base to the pot. Stir well to combine. Add in 1/2 cup Gallo Cabernet Sauvignon Wine and enjoy the wonderful aroma! Add 1 tablespoon Worcestershire sauce too. Toss in 2 sprigs of fresh parsley, 1 sprig of fresh thyme, and 1 bay leaf. For ease in removing the herbs later, I suggest bundling them with kitchen twine. Simmer the soup mixture over medium heat for about 30 minutes. Give it a stir every so often. This is where you'll be tempted to take a little taste test . After about 30 minutes of simmering, remove and discard the herbs. Add in 1 tablespoon balsamic vinegar and give it a taste. Add salt and freshly ground pepper as needed. Cover and keep warm over low heat. Turn oven broiler on high. Slice the french bread into thick slices that will fit in your serving dish. Mix up some garlic butter by combining 2 tablespoons softened butter with 1 teaspoon minced garlic and a pinch of salt. Spread this mixture on one side of the bread slices. Arrange the bread slices, butter side up, on a foil lined baking sheet and place under the broiler until nicely toasted. Remember to leave your oven door ajar while broiling and watch the bread closely so it doesn't burn. To serve, fill oven safe bowls with soup about 3/4 full and top each bowl with 1 slice of toasted garlic bread, 2 slices of Gruyere Cheese and 1/4 cup of Asiago Cheese. Place bowls on a baking sheet and place the baking sheet under the broiler to melt the cheese. Sprinkle with paprika and enjoy! Oh my goodness that is some cheesy soup and just the way I like it. Yum! haha No shortage of cheese that is for sure! Thanks, Renee! Oh, my gosh, I want that spoonful of cheese to be transported right into my mouth! I love French onion soup...and my favorite part is that cheesy crouton! That's my favorite part too! :) Thanks, Liz! I love French Onion soup! This one looks so warm, cheesy, and comforting! OMG! Your soup looks so cheesy and delish! I would love a big bowl of this soup! Oh my goodness - your pictures have me drooling! Just beautiful. All that cheesy goodness!!! Gimme! Ohh, that cheese! I absolutely love french onion soup and do order it when ordering soup out. Never have made it at home. That is about to change! Looks delicious and flavorful. I also love what Gallo is doing to raise funds to stop hunger! It's really easy to make and the house smells wonderful when you have a pot of this on the stove! I love the Gallo Cork Campaign too! Such a great idea for a worthy cause! Thanks, Shelby!! Wow. This looks unbelievably amazing.. I nearly have no words. I LOVE cheese!!! I would love to have this on a cold blustery day sometime soon, pinned!!! Thanks, Yvonne :) I hope you get to try it! It really does warm you through and through! You have no idea how much I want some of this right now! Fabulous recipe!! this is one of my very favorite soups and this version looks especially delicious! I need to find a way to squeeze this into this week's menu! I hope you get to try it, Renee. It's super yummy! Thanks!! I HAVE to know...did you have to do two shoots for that gorgeous top shot? I would have peeled that gooey incredible cheese layer right off and eaten it..and THEN add another cheese layer for the soup! haha That was a ONE shot deal, Betsy! Once all that cheese was disturbed it just didn't look right for any other shots. So lucky it turned out!! Thanks so much! Love, love this! I agree that taking someone soup is a comforting thing. We'll be saving those corks too. Me too, Sandra! I swoon over cheese! and wine too - can't forget the fantastic wine :) Thanks!! I want that cheese! I also love that you added a fullbodied wine to this soup. I imagine that gave it an awesome depth of flavor! The wine really did make all the difference, Erica! Thanks so much! That just looks like the cheesiest, most amazing soup ever! I love French Onion Soup! And those photos! Gorgeous. The cheese! The CHEESE! That gooey cheese and toasty bread is just magnificent! Ohhhhh Myyyyyyy I just want to grab a spoon and dig into all of that cheesy goodness! !